Dionysus, the God of wine was once drunk on wine. Later he awoke, surrounded by pirates, far out at sea. 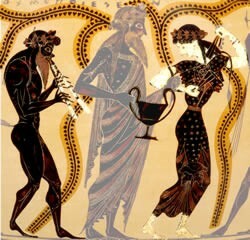 The pirates laughed at who Dionysus claimed to be, all except one. Dionysus begged them to let him go back onto land. The pirates refused to let him go and took him further out to sea. One of the pirates however begged for the other pirates to let Dionysus go. That is when Dionysus lost temper and filled the boat with wine and vines. All the pirates jumped out of the boat in fright. Dionysus turned every pirate into dolphins except the one that believed what the God had said. 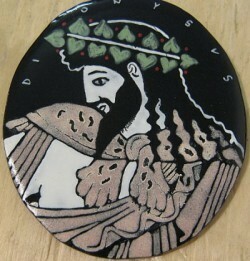 Dionysus is the God of wine. He is also the son of Zeus (God of the sky). He is connected with drama and theater. His many symbols include vines, wine and a Kantharos (a special cup of wine). Dionysus was born in Thebes, a city in Attica. Many myths that include Dionysus are based in this city.